"He (Isaac) had so many flocks and herds and servants that the Philistines envied him. So all the wells that his father’s servants had dug in the time of his father Abraham, the Philistines stopped up, filling them with earth. So Isaac moved away from there and encamped in the Valley of Gerar, where he settled. Isaac reopened the wells that had been dug in the time of his father Abraham, which the Philistines had stopped up after Abraham died, and he gave them the same names his father had given them. One thing to note right away is this principle concerning wealth: The more you have, then the more you have to care for. And, the more God gives you, the more you have to manage responsibly. Like his father before him and the heroes of faith that would follow, Isaac could hold firm and stay on course because he understood the promise, the purpose and the ultimate plan of God! It was now Isaac’s turn to face the opposition, manage the Promise of God responsibly and hold his assigned position for his generation. Kosmokrator (Gr) - Rulers (Eng) - kosmokrator is a Greek word found only once in the Greek New Testament. In Ephesians 6:12 kosmokrator is translated “rulers,” or “world forces.” It was originally a word referring to the powers of the skies in astrology and eventually came to be used of the pagan rulers and emperors of Greece and Rome. In Ephesians 6:12 kosmokarator are listed along with three other ranks of demonic forces of Satan that are not of the fleshly world. Can I continue to believe God's Word in the face of opposition? I will trust God and be flexible in situations in order to continue doing what God called me to. This is a model of a letter that mentions the city of Jerusalem, or Urusalim, and was sent from Jerusalem (Urusalilm) to Tel Al-Amarna around 1300-1400 BC. 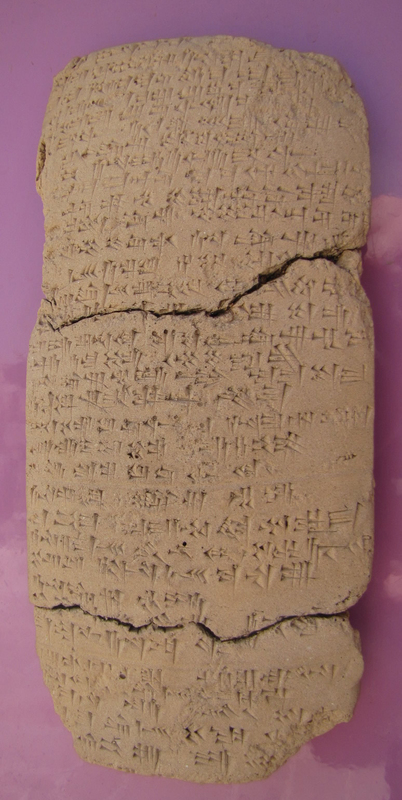 It was found in the Royal Archives of Tel al-Amarna in Egypt among 350 other letters written in cuneiform script.This clay tablet is one of the six letters written to the Egyptian kings by Urusalim's ruler during the days of Joshua and the early chapters of the book of Judges. 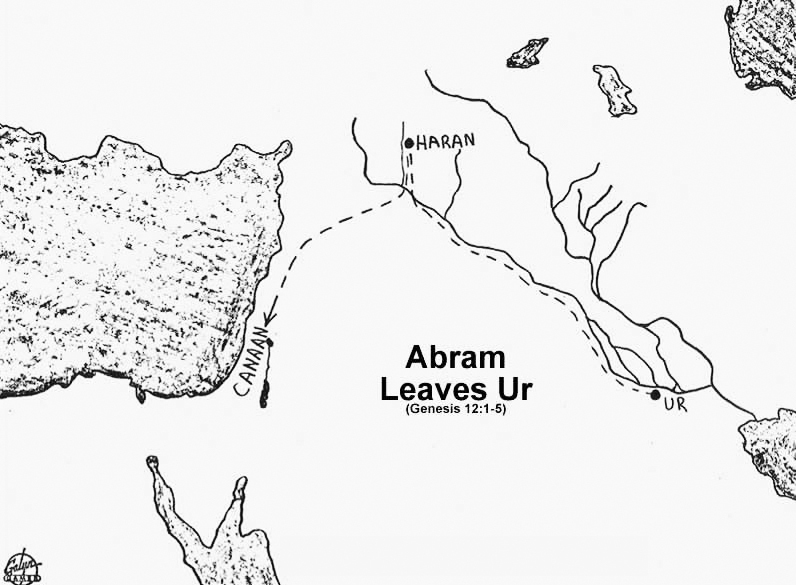 Map of Abraham leaving Ur. "If the gaze of man awakens fear in us, how much more so the gaze of God. If we feel exposed by people, we will feel devastated before God. To even think of such things is too overwhelming." Christianity is accused of being intolerant because they say that Jesus is the only way of salvation. But, all religions come to a place in this discussion where they also draw a line in the sand and refuse to compromise: 1. Hindus believe in many Gods, and cannot tolerate the one true God. 2. Buddhists cannot accept the scriptures of Hindus and Christians. 3. Muslims will not tolerate disagreement with the Koran. 4. Atheists cannot accept any religion that believes in a God or any Gods. With all this conflicting "truth" we hope that the religion that is correct will stay committed, or intolerant, until all of us can see the evidence that proves their "truth" is the Truth!...and, we hope they feel the same way about us!! "A good man obtains favor from the Lord, but the Lord condemns a crafty man." There is always a way out of temptation and sin. The lack of an escape route is not the problem with temptation. The problem is lack of desire to see the way out and use the escape route. “Hear my words, you wise men; listen to me, you men of learning. For the ear tests words as the tongue tastes food. “Job says, ‘I am innocent, but God denies me justice. He keeps company with evildoers; he associates with the wicked. “So listen to me, you men of understanding. Far be it from God to do evil, from the Almighty to do wrong. Who appointed him over the earth? Who put him in charge of the whole world? all humanity would perish together and mankind would return to the dust. “If you have understanding, hear this; listen to what I say. “His eyes are on the ways of mortals; he sees their every step. There is no deep shadow, no utter darkness, where evildoers can hide. God has no need to examine people further, that they should come before him for judgment. Without inquiry he shatters the mighty and sets up others in their place. Because he takes note of their deeds, he overthrows them in the night and they are crushed. because they turned from following him and had no regard for any of his ways. to keep the godless from ruling, from laying snares for the people. “Suppose someone says to God, ‘I am guilty but will offend no more. Oh, that Job might be tested to the utmost for answering like a wicked man!